Job boards face the growing challenge of demonstrating the value they can add. Their ability to dominate search engines – and so provide a compelling means of reaching candidates – has gradually been eroded by the rise of job aggregators like Indeed. Now those aggregators are seeking to bypass job boards altogether and sell direct to employers. So what value is it that you bring to the table, what candidate access do you provide that a recruiter couldn’t buy more cheaply elsewhere? This is a question undoubtedly weighing on the minds of job board owners across the globe. Nobody wants their business to become the next Simply Hired. Fortunately there’s a ready-made answer in the form of social media, which has the potential to drive tens of thousands of candidate visitors to your niche job board month in month out (far more if you’re a multi-sector job board). So how can you carve yourself out a winning strategy based around dominating social media? The first step in being successful on social media will be easy for anyone with an internet marketing background to understand. We need to have social media profiles that have a high conversion rate – that succeed in persuading a first-time viewer to follow / like you so that they sign up to receive your ongoing updates. Then once we have high converting profile pages, we need to take steps to ensure more and more people see those profile pages each day – and therefore drive up our follower numbers. The fundamental element of success here is making your social media profiles valuable, insightful or entertaining for your target audience. Your bios should lead with the reasons people will want to follow you – and your last few updates should reinforce the impression that you are worth following. This requires a mindset shift in our industry. Instinctively job boards have bios that sell the fact that they are a great job board – and push out a stream of vacancies via social media. This combination simply doesn’t win over anyone but the most desperate of job seekers – and the jobs themselves are completely untargeted to the recipient. To be clear, you don’t have to have much or any content of your own to be able to build up a commanding position on social media. Being valuable, insightful or entertaining can involve nothing more than “curating” content – that’s to say finding and sharing the very best content from around the web for your chosen audience. However at a certain point you’ll have built a sizeable audience and would dearly love for more and more of that audience to be visiting your job board. Even more than that, you’d love for them to be recommending to their network of contacts that they should visit your job board too. The surest way of achieving this is to have some great content on your own site. You don’t need to be prolific, but a couple of fresh posts a month will transform your effectiveness. Better still, focus on writing posts that are “evergreen” and you’ll be able to continue sharing them and attracting interest to them for literally years to come. (There are SEO benefits to doing this too. Regular fresh content is good for the ranking of your site, as is your site generating more and more favourable social signals such as likes and shares of your content. That’s beyond the scope of this post, but on its own can be a compelling enough reason to act on this). Winning advocates for your business. How would you like to transform that person who’s just shared a piece of your content into someone who regularly shares your content and becomes an advocate for your brand? The surest way of achieving this is to notice the initial share, engage with that person, make them feel valued and have them warm to your business. Winning over influencers in your industry. In your market I can guarantee that there are already hundreds of social media accounts reaching the exact audience your business wants to reach – and who have sizeable followings but don’t compete with you. I’m referring here to the likes of Journalists, Conference Speakers, Training Companies, Industry Publications, Industry Bodies and respected Industry Commentators. If just a few of these start to regularly re-share your updates, the reach of your job board on social media will be catapulted more or less overnight. Guess what – the way you’re most likely to achieve this is by engaging with those influencers, commenting on their posts, re-sharing them with your own followers, sparking conversations. Another reason it’s so important to make time to engage. Generating the desired end outcome from social media. Hopefully your social media strategy will be based upon a target audience that you want to reach – and an action that you would like that audience to have taken so that you can clearly see some business value flowing from social media (this might be candidates registering for your jobs-by-email alert or potential clients requesting a call). The surest way of producing this outcome is to proactively engage prospects in conversation on social media and to drop into the conversation the idea that they might find it valuable to… (insert here the action you would like them to take). Of course there’s only one problem with the above activities – and that’s the fact that they require an investment of time. So another key element to being successful on social media is to ensure that you devote the resources needed for success (rather than asking someone on the team to “take care of our social media presence when you have a few spare moments each week”). Job boards have historically been big spenders on pay-per-click traffic, most notably from Google and more recently from a variety of job aggregation services. What’s striking to me is how few have invested in understanding the PPC advertising options that social sites offer – and the conversion tracking available to help you really understand the campaigns that are performing best. 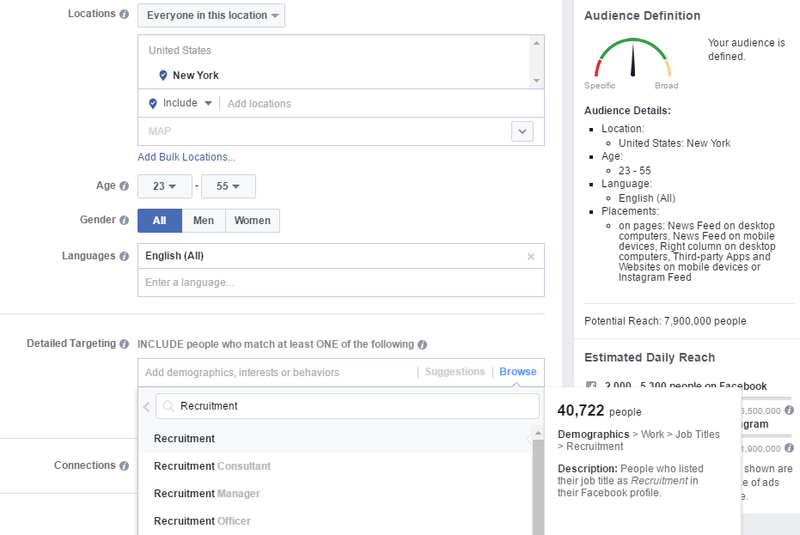 For example, have you fully explored the fact that you can run PPC campaigns on Facebook targeted at people in a specific location, age range, income bracket and with defined job titles or career interests? If you’re like most business owners I speak with, you are probably yet to investigate or exploit this opportunity. From Instagram to LinkedIn, Pinterest to Twitter, the social sites have all been gearing up to sell you targeted advertising options. By and large they have a lot of inventory to sell – and fewer bidders than eg. Google PPC. That’s a great combination if you’re looking to buy into a lower cost source of targeted traffic for your business. Last but not least is the potential to retarget candidates (and clients) by using re-targeting campaign formats on social media. Several social sites offer you the opportunity to target your adverts at an email list – and we find that Facebook for example can usually match 40% – 60% of an email list to users of Facebook. So consider for a moment all those inactive jobs-by-email subscribers you have – and all those candidates who’ve registered on your CV database but not returned to the site for some time. Now you have the ability to entice them back with a series of advertisements run in their Facebook feed for example. Powerful stuff! Similarly you can insert code from social sites into your website header and then they will track all their users who have visited your job board. You can get really hyper-targeted here. How about putting a specific message to recruiters who visited your advertising packages page but never purchased from you? Or a reminder to candidates who visited your CV registration page but never went ahead and uploaded their CV? The possibilities here are immense – and largely untapped within the job board market. This guest post was contributed by Tony Restell, Founder of social media agency Social-Hire.com. 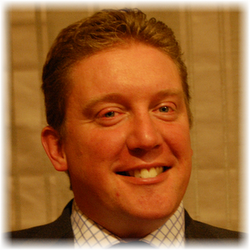 Having worked with job boards, recruitment technology companies and recruitment agencies, Tony is one of only a handful of social media experts with specialist knowledge of our sector. Prior to this role, Tony built and sold a job board business and is a respected guest speaker on topics related to recruiting and social media. Follow Tony on Twitter at @tonyrestell.